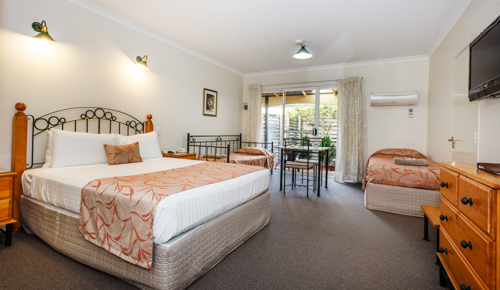 More spacious than our Standard Rooms, Deluxe Rooms have their own ensuite, tea & coffee making facilities, bar fridge, reverse cycle air-conditioning, and a large flat screen TV with Foxtel and local channels. These rooms also have a small kitchenette, table & chairs and a private courtyard. We have two rooms which can be inter-connected with another room, great for the family.